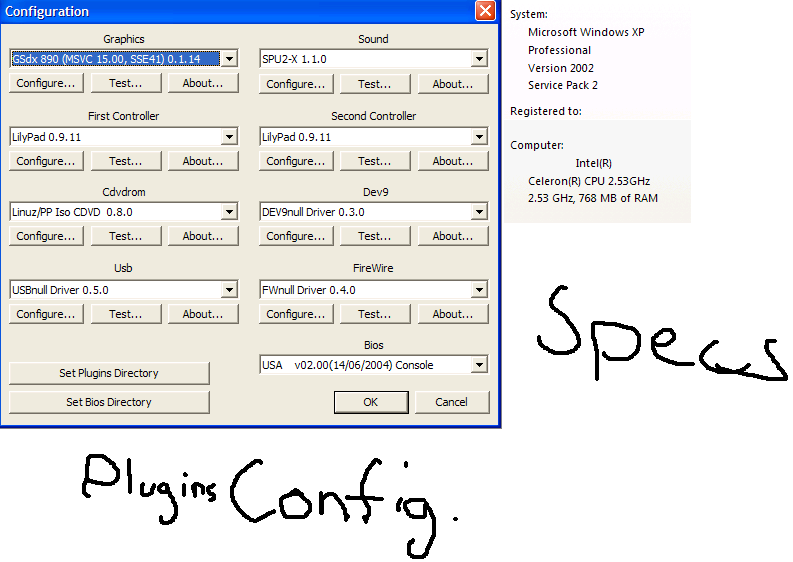 1 - update Directx and get latest gfx drivers. 2 - enable native resolution in gsdx. What? First of all, celerons don't have SSE4 (And unless a very recent model, not even SSSE3), so change your video plugin to GSDX SSE2. This needs to be changed regardless of whether it's the cause of that particular error you're getting. (03-17-2009, 09:14 PM)Trigun Wrote: First of all celerons don't have SSE4 (And unless a very recent model, not even SSSE3), so change your video plugin to GSDX SSE2. No... same version as the other, except it should say SSE2 instead of SSE41. Should read GSdx (MSVC 15.00, SSE2) 0.1.14 in the configuration. You should be using that package if you are new to PCSX2. It includes the SSE2/SSSE3/SSSE41 versions of GSDX.